Can Acupuncture help to Quit Smoking? February 16, 2016 February 16, 2016 ATWAcupuncture, Latest NewsLeave a Comment on Can Acupuncture help to Quit Smoking? Trying to stop smoking can be extremely difficult and all the nicotine gum and patches in the world sometimes can’t give you the help we need. Acupuncture is a treatment that not many people think of when trying to stop smoking but can offer relief especially during your initial stages of withdrawal. In this stage people often face symptoms such as irritability, fatigue, anxiousness and obviously the strong craving to smoke again. Acupuncture works by treating each of these symptoms individually so that you can be aided on your path to be smoke free. People turn to acupuncture for different reasons, many people don’t like the idea of using drugs to combat their addiction to nicotine and unlike these types of medication there are no unwanted side effects to the treatments. Acupuncturists target specific pressure points of the ear to help suppress any cravings the patient might be experiencing. In between these treatments patients are encouraged to use ear seeds as a form of acupressure. These little plasters have small metal balls attached to them in specific areas helping the patients to curb their urge to smoke whenever they feel like they need it. This type of acupuncture also helps to promote the release of endorphins which allows relaxation and calm in the patient. There have been many studies which have shown that acupuncture is successful in helping people deal with nicotine withdrawal and to stop smoking completely. Most commonly patients report that they feel better mentally, they are getting more sleep, are less irritable, don’t crave cigarettes as much and their bowel movements are much more regular. Generally the best results are found when acupuncture is combined with traditional treatments. Most acupuncturists will ask their patients to not smoke for at least 24 hours before their first consultation appointment to prove that they are serious about quitting. If a patient can take this first step it shows their willingness to quit and is the first major step on the road to recovery. For more information about how we can use acupuncture to help you quit smoking, call us free on 0800 051 76 88. With obesity on the rise in the UK, people are desperate to find a quick fix solution to their problem. One of the biggest problems people face when trying to lose weight is how unhealthy it can be and in an attempt to reach their goals they get ill. Fortunately, acupuncture can aid people in the weight loss process. 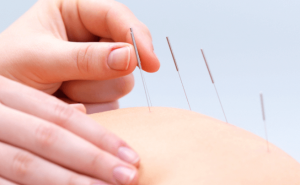 Acupuncture involves inserting fine needles into specific points on the body to stimulate the release of endorphins. In doing so this creates a calming effect allowing you to relax and release any stress or anxiety. In terms of weight loss, acupuncture can calm people and in turn help them lose weight without resorting to any unhealthy diets or drugs. There have been numerous studies which have shown that when acupuncture is combined with traditional methods of losing weight patients are able to lose significantly more. In these studies usually one to three acupuncture sessions helps people in achieving their weight goals in a safe and effective way. Some people notice the effects of their treatments relatively quickly and only need treatments every other week. One specific study found that acupuncture coupled with a 2000 calorie diet and a 15 minute walk helped with with weight loss. The study consisted of 20 overweight women ranging from 20-40 years of age. The study showed that half of the women who received 15 minute acupuncture sessions once a week lost 10 pounds on average as well as a decreased appetite. Those who did not receive acupuncture were only able to lose an average of 3 pounds. Generally in traditional Chinese medicine it is believed that weight loss is caused by the liver and spleen malfunctioning. Acupuncturists because of this tend to focus on areas corresponding to these organs to rebalance the body. 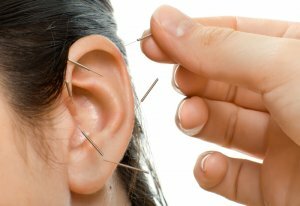 Another area acupuncturists tend to focus on is ear stapling which involves carefully manipulating points on the ear which control cravings. This type of acupuncture is also used to help people to stop smoking or to help beat drug addictions. Ready to book your Weight Loss acupuncture appointment? Call us on 0800 051 76 88 to arrange an appointment now or use out contact form. I was recommended Acupuncture by my Mum, who had used it in the past for a different issue. After suffering with extreme morning sickness, to the point of not being able to go into work, I was willing to try anything. Instantly upon meeting Cath, she was extremely friendly, warm and reassuring. She put my mind at ease immediately and made me feel “normal” for the way I was feeling. I was sceptical at first, having never tried anything like this before, but it is relatively pain free and quite a relaxing experience. Cath explained what she was going to do and why. So every time she placed a needle, I knew it was coming and I knew why it was there and what she was hoping to achieve by it. It doesn’t hurt. You may feel a sharp pin prick the first time you attend, but after that, nothing. Afterwards, I felt flushed and tired, but in a nice relaxed way. I started with two sessions per week, and I honestly think the sessions help to ease my morning sickness. So much so that when I missed a week once, I knew straight away, as I felt lethargic and sick immediately, as though my body was telling me I needed a top up. It didn’t cure my morning sickness completely, but it helped manage it to a point where instead of being sick all day, every day, I was sick, maybe once in the day, which was a huge improvement, and helped me to lead a more normal life. Quickly I dropped down to once a week and now do not need it at all. Cath helped me during a time that was very distressing, worrying and wearing on my mind and body. I felt cared for and looked after during each session and I will always be grateful to Cath for helping me through this difficult time. I would have no hesitation in contacting Cath for acupuncture in the future should I have any other medical or lifestyle issues, as I 100% support and believe in its benefits.